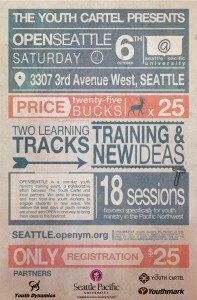 Saturday we are part of a brand new type of Youth Ministry Conference. Here’s a big chunk about Open Seattle from Adam McLane’s blogpost last week. What if a national organization gave leadership to local organizers? What if front-line youth workers were favored in speaker selection over those on the speaking circuit? What if we took chances instead of playing it safe on the stuff we present? What if The Youth Cartel didn’t have to fly its name out front, but instead lifted up the names of its partners? What if none of the speakers got paid? What if I didn’t have to get paid to help organize it… I just did it for a fair share? Speaking of money, what if a local YM charity was benefited financially? Heck, what if we just posted the full event budget online for anyone to see? Why not record everything and then share all the sessions with the community on a central website… so no matter where you live you can have access to training resources and the freshest ideas out there on the ground? What if we perfected the thing and just kind of open-sourced THE WHOLE THING so we can help people who have been to one organize one themselves? My hope for the answer to all of those questions is… I think that the best ideas will be given a voice. My hope is that when front-line youth workers get an opportunity to share what they know and even their big, crazy ideas with a group of people just like them… that it’ll spur on more ideas and spark new innovations with the net result that we’ll reach more teenagers with the Good News. So yes, it’s an experimental thing. Originally there was a lot of risk. It was really hard to explain the overall concept to the first few partners– Jeff at SPU, Brian Aaby at YouthMark, Mark Moder at Youth Dynamics. But as we kept talking about it this idea really took off. They made the idea even better. I think it’s gonna be a fantastic event. I love the whole concept. If you have a team it’s a cheap local training with some great regional speakers. And I’m uber excited about my new session.